Planning what to sew for spring will make spring actually come right? We have had snow here in Denmark for a week or so, but it's gone now and it feels like winter is loosing it's grasp. Maybe we will have another snowstorm, but today it feels a bit like spring. So I'm calling of sewing winter clothes and starting planning what to sew for spring. Sewing takes a long time, so I like to have a plan for what to sew for the upcoming season, before I really need the clothes. This spring I really need a new spring coat and I have seen this from the danish brand Baum und Pherdgarten's spring 2016 collection and will use it as inspiration. I have the simplicity 1015 pattern in my stash that I will alter so it will look more like my inspiration picture. I have already bought some navy cotton twill and I have lining in my stash so I'm ready to go. 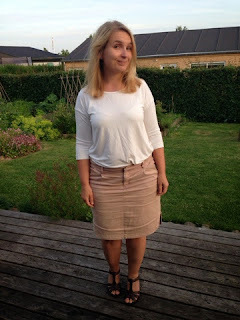 I need more separates for work and I think I'll start sewing this top in a blush wool viscose crepe. The pattern is the Cézembre top from Annaka Couture. You can find the pattern here. A more likely scenario would be some dress sewing! I have already cut this burdastyle dress out. You can find it here. I have some gorgeous cotton silk in navy and green (very springy colours!) left from my Paris fabric raid last summer that hopefully will be perfect for this dress. And the Wenona.. 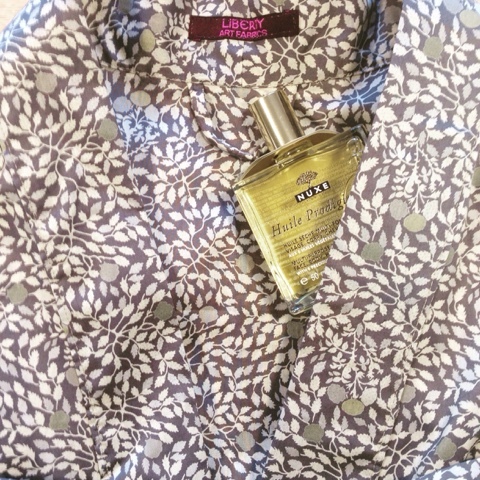 Such a great shirtdress. It has been on my sewing list since last spring and I still haven't made it. This spring it will happen. I'm planning to sew it up in some Robert Kaufmann chambray - can't get enought of that. Have you started sewing for spring yet? What are your plans - please spill the beans - I'd love to read all about your fantasy spring wardrobe. Hello neclected blog - I must admit I'm constantly cheating on you with my favorite Instagram..
Merry belated christmas and happy belated new year to you. I hope you had a wonderful time. I had almost two weeks off from work and spend the time with family and friends - and quite a few hours in my sewing room. Such a bliss. My new year resolution is to update this blog on a more regular basis. Let's see how that goes. I made quite a few christmas gifts this year. I try to make something I hope the recipient will like - and something that doesn't require too much fitting. 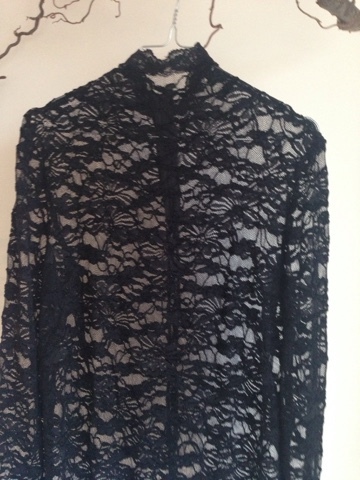 This year I have been most happy about the laceblouses I made. They are all made from elastic lace purchased locally from shops with no website - sorry. The two blouses are from a turtleneck pattern from the november issue of Burdastyle and the cami is selfdrafted. 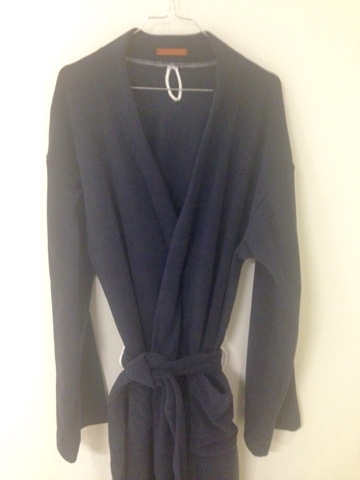 The two turtlenecks have a zipper in the back and are closed with a small button. 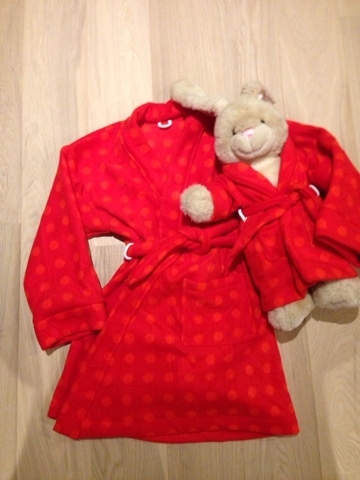 I made this size 7 kimono in polar fleece for my niece with a matching one for her teddy. This last kimono is my favorite. I made it for my sister in a lovely liberty tana lawn - a long resident in my stash. 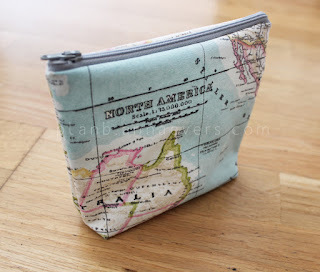 In fact I actually gave her a toiletry bag last year from the same fabric. 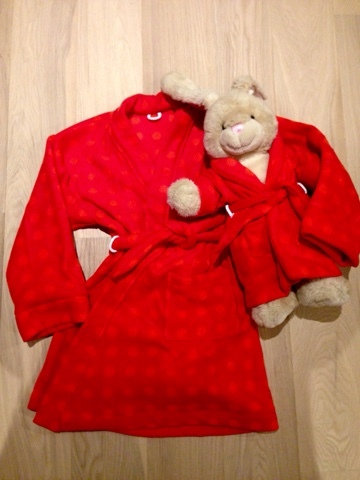 About time she got the matching robe right? 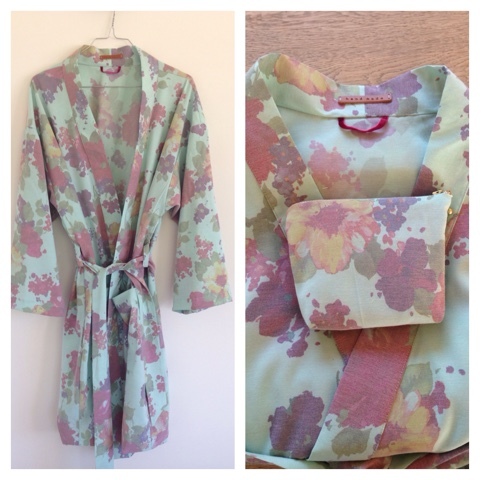 She's on maternal leave right now and lets be honest - There are quite a few days you never get out of your robe when entertaining wee babies, so the robe better be pretty. This last gift is a woolen scarf for my mum and almost doesn't qualify as sewing. 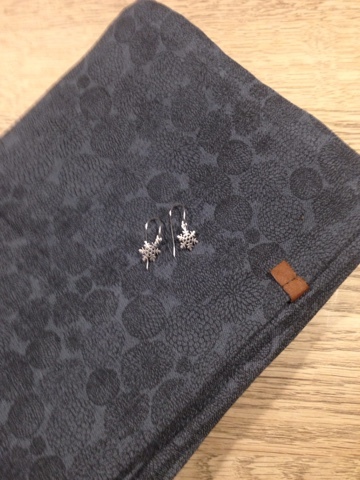 It came with a pair of silver snowflake earrings. I almost kept this scarf to myself since I like the fabric so much. It's a teal wool blend with subtle flowers from Stofdepotet. I'm afraid the fabric is now sold out. I have already started planning my sewing for spring. More about this later - had to wrap up christmas first! 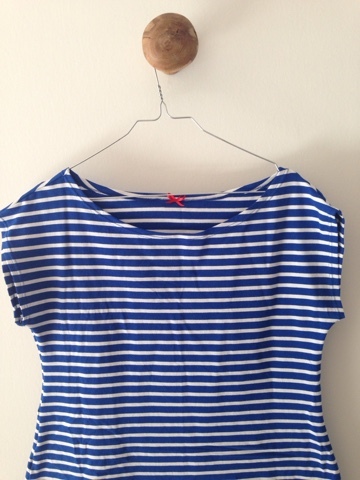 Have you started considering what to sew for spring? Right now I'm mostly thinking about dresses, floaty blouses and a new spring coat... So many options, so little time.. I've tried to make a little list of my surgestions for gifts. Some I've previously made - but I'm not showing this years production until after the big reveal on christmas eve (here in Denmark we open the gifts on the 24th in the evening). If you find some great fabric a t-shirt could make a good present. There are many good patterns online but my favorites are the free t-shirt patterns the Hemlock T-shirt and the Kirsten Kimono T-shirt.They are both easy to make and not formfitting. Have you made any handmade presents yet - or do you plan to? Please spill the beans if you have any good surgestions! I'm so happy to show you this coat. I have been working on it for about a month - on and off - and now it's finally finished! - Just in time for the cold and the snow that hit Denmark this weekend. I wrote a blogpost about the construction process here, so this post will be all about the pictures and me rambling about what I've learned. I chose a simple, classic sillouette for my first babysteps into coatmaking. I'm hoping a classic coat will last me more than one season - and that all the tailoring will make it look good for more than one season too.. So what did I learn from this project? - I learned a lot of the basics of tailoring. I now know the dirty secrets of a good coat and the amount of time it takes to make it. - I learned that using horsehair canvas the right places will add stability and a more professional look to your garment. The horsehair canvas also helps to shape the fabric properly. - I learned to use beeswax to reinforce the thread when sewing by hand. - I learned to use sleeveheads. I can't understand why I haven't done that before. Sleeveheads are from now on, a must do for my slopy shoulders when sewing a jacket or coat. In the next two photos you can see what a sleevehead and shoulderpads can do for a coat. 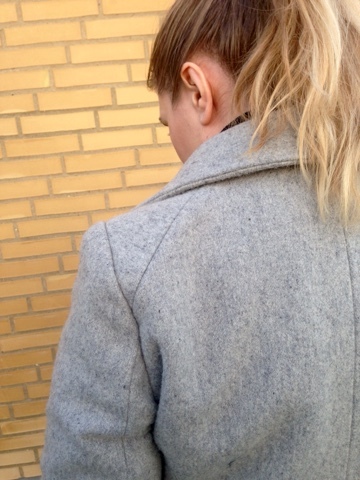 Here you can see how I lined my coat. It's a navy-black twill weave acetate lining I've used. 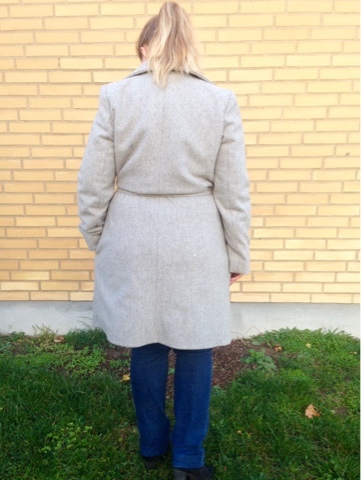 The lining is hiding all the tailoring made on this coat and the interlining. I used two large snaps to close the coat properly. I guess, I could have gone with just the belt, but since this is a wintercoat, I feel it's nice with a possibility for a proper closing. 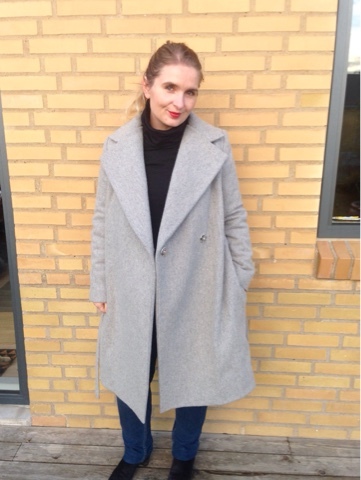 What would I do different next time I make a coat? - I would use horsehair canvas down the front instead of fusible interfacing. I think I would still use fusible interfacing on the facings and the hemlines of the sleeves and coatbody. 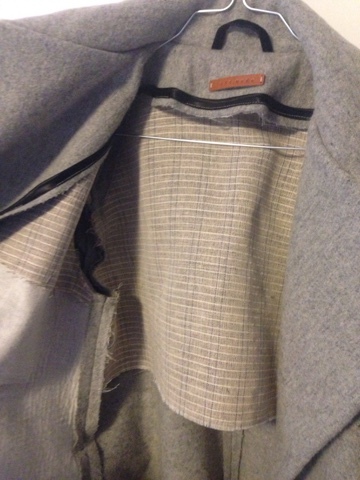 In this coat I only used horsehair canvas on the lapels, and for shoulder reinforcement and in the collar. 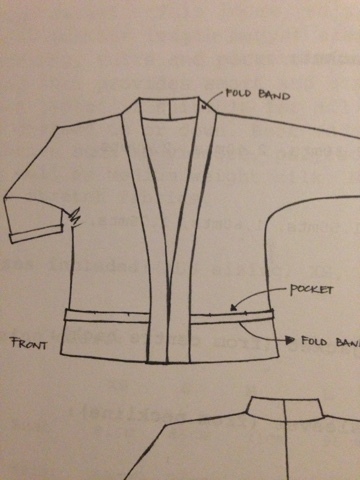 Have you got any good advice for coatmaking? Have you planned any coats this season - or have you already made one? Please spill the beans! 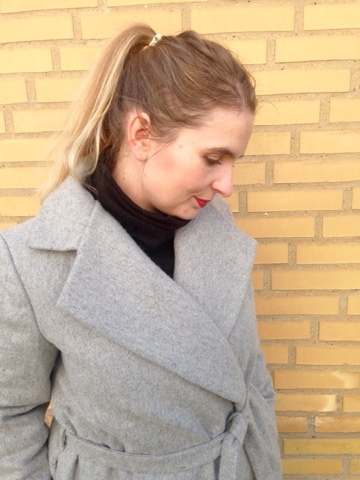 I made a coat! I never thought I would in a million years - always been scared of all the tailoring involved. 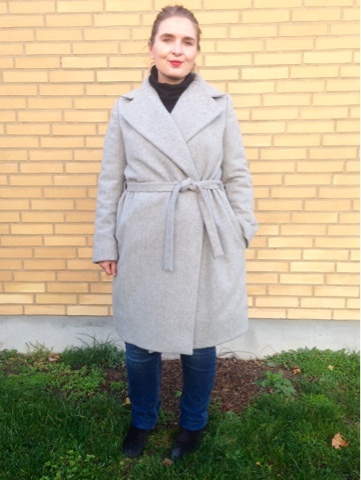 This year I was really in need of a new wool coat and my inner cheapgoat won me over. 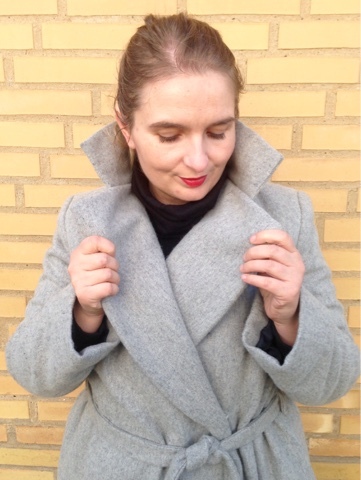 The coats I like in the shops are usually quite expensive and they don't fit me that well since I'm two sizes bigger around my derriere compared to my bust - I call it extreme pearshape..
Last year I made this coat - or put correctly a coatigan. It didn't involve any tailoring apart from fusible vlieseline and was frankly a really easy make. Last winter I had this thought of one day being able to make a proper wintercoat, but I never imagined I would take the leap this fall. 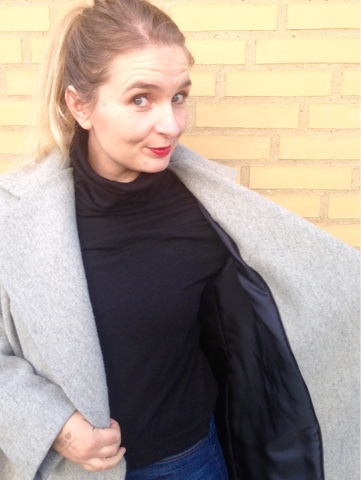 I'll break up my coatmaking in two blogposts. This first one will be about all the work put into making a coat and the next will be the big reveal. Sit tight if you are curious about coatmaking. It wasn't as hard as I imagined, but I wouldn't recommend it to the faint of hearted or for the very impatient seamstress. 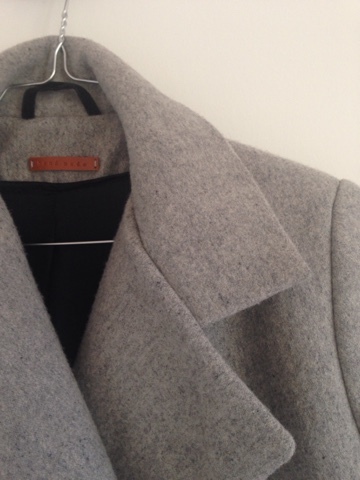 First, a sneakpeak of my finished coat before rambling about all the steps for making a tailored coat. First, choosing a pattern. 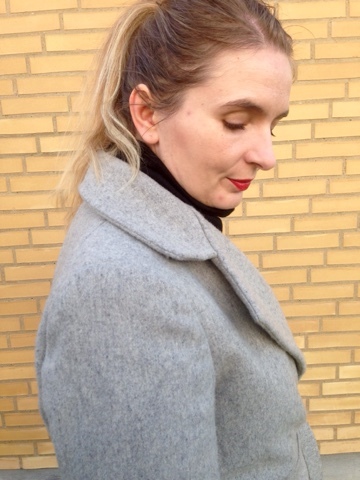 I had a picture in my head of the coat I wanted to make. Unfortunately my dreamcoat didn't come with a readymade pattern, so I used pattern no. 102 from the november issue of Burdastyle 2013. This pattern isn't really suited for a wool wintercoat. First of all, its made of linen cut on the bias.. Who wears an unlined linen coat in november? Not in my hemisphere. I decided to change the grainline of the pattern and make a muslin to test the fit, when cut with a more ordinary grainline. I cut the coat one size larger than my usual size, since the wool, interlining and lining are much more bulky than one layer of linen. My muslin showed, that the sleeves were very narrow so I made the sleeves wider - I want to be able to wear a sweater underneath the coat. I used this Threads article on how to make the sleeves wider. On another note - please consider using a two piece sleeve, when making a coat. Your arms doesn't hang straight down your body and so shouldn't your sleeve either. A coat sleeve is usually quite thick and this will result in pull lines across your sleeves if you don't use a two piece. This is especially the case if you use a narrow sleeve and less so with a wider sleeve. Burdastyle is notoriously known for providing very sparsely sewing guidance. 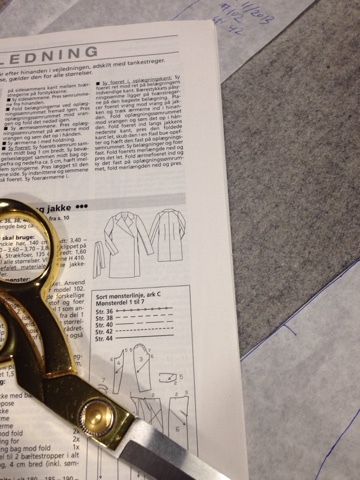 I therefore also bought the book "Tailoring - sewing the perfect jacket" from Amazon. I would never have been able to make this coat without this book. Please ignore the pictures from the eighties - the author knows all about tailoring a jacket. I referred to this book again and again. The book also tells you about the difference between different tailoring methods and where to use them. I highly recommend this book if you are interested in making a tailored coat or jacket. Second step in my coatmaking was gathering the supplies. I bought this nice kashmir blend wool from Metermeter. It's so soft, but presses beautifully. 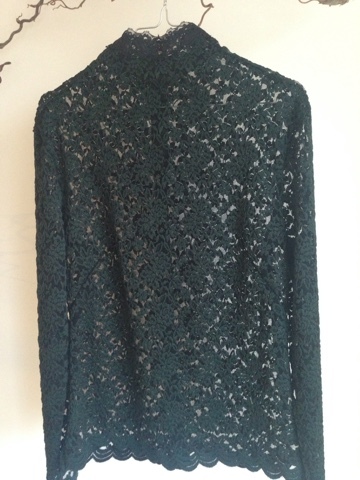 I bought this lining from Stofdepotet in a darker colour. It's unfortunately now sold out. It is a nice twillweave in a navy-black colour. 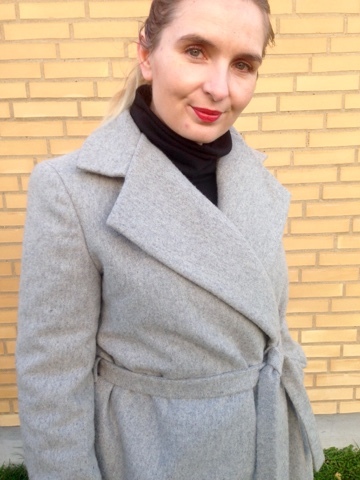 Since I live in Denmark, I wanted my coat to be really warm so I can use it all winter. I therefore bought a thermal interlining. The interlining is really thin - almost as thin as the lining and doesn't add much bulk - only thing about the interlining is, that you shouldn't put your iron anywhere near it or it will melt. So be careful about the steps in your coatmaking and don't put your interlining in before you have finished pressing your coat. New to me in this coatmaking process was horsehair canvas. 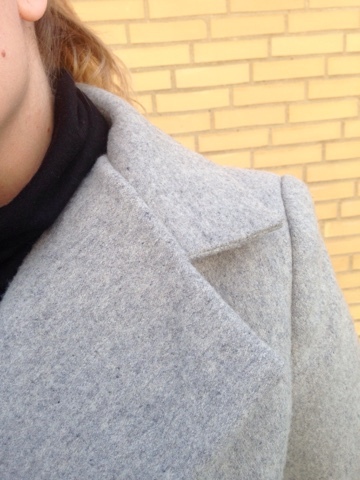 It's a sew in interfacing that adds a crispness to your coat a regular fusible will never do. 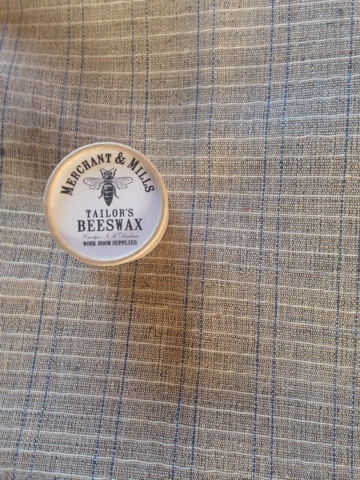 New to me was also using bees wax to enforce the thread when handsewing. This worked so well and I will surely use this again. 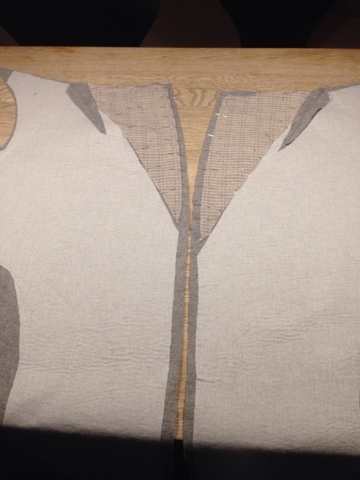 Third, after cutting out all your pieces the tailoring part begins. Some patterns (esp. vintage) will have pattern pieces for the sew in interfacing as well. Since this is a Burdastyle pattern it doesn't. I had to make pattern pieces myself. I'm no expert, but I can tell you how I did it. 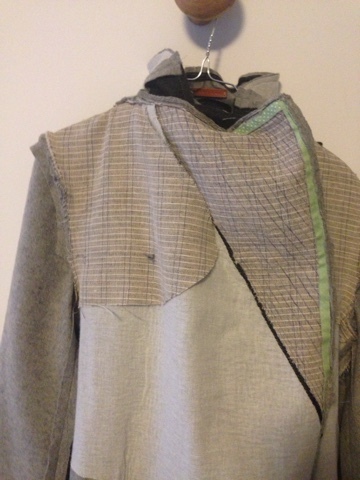 I cut out sew in interfacing (the horsehair canvas) for the revers seperately and then for the front - see picture below. I also cut out a backstay and back undercollar in horsehair canvas. I used fusible interfacing to stabilize the front and facings. I also used fusible interfacing to stabilize the hemlines on the coatbody and sleeves. I used the advice given in my tailoring book and i'm quite curious how the coat will hold the shape after some wears. 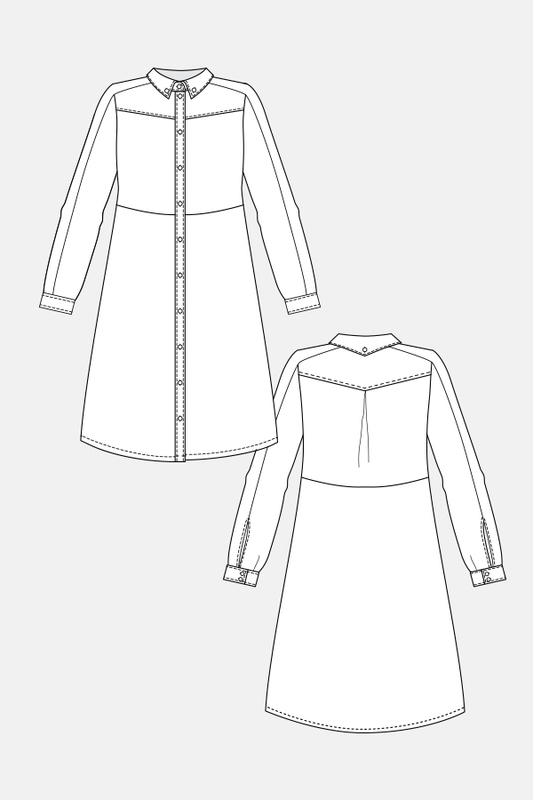 I hope the different types of interfacing will make the coat last for more than one season. This picture shows how I sewed in the horsehair canvas on the back undercollar. I drawed the rounded lines by hand and then used patchsticthing to shape the undercollar to hold is shape. Here you can see how I interfaced the front pieces. First a generel fusible interfacing (but not on the revers) and then a sew in interfacing on the revers and on the shoulders. Be sure that the sew in interfacing on the revers ends excactly on the foldline, where you want the revers to fold back. Here you can see how I interfaced the revers. After the sew in interfacing I added a sturdy ribbon - any will do - the green is actually for giftwrapping... - add the ribbon to the edges on the revers but not in the seamallowance. Also add a ribbon on the excact foldline. Mine is black here. Also, note that its really important that you sew the interfacing on the revers in correctly. Its the seamlines that will make the revers fall nicely to the correct side. Here you see my lines. I sewed along the drawn lines on my sew in interfacing. The coat sure isn't pretty on the inside, but all this is to help build and stabilize the shape of the coat. I forgot to take pictures of my sleeveheads. The sleeveheads are used to stabilize a nice rounded shoulder and prevent it from collapsing during wear. My tailoring book told me to use lambswool for sleeveheads, but I didn't have any. I turned to instagram for help and the lovely Nanna from How to make fashions told me just to use the wool from my coat. I cut two pieces of the wool on the bias - approximately 3-4 cm wide - and sewed it into the sleeves between the front and back notches (not under the arm) stretching the wool slightly as I sewed. 2-3 cm of the biasstrips were in the sleeves and 1 cm in the coatbody. That way the bias strips will prevent the sleevehead from collapsing. Hope this explanation makes sense? On the last photos you can see my backstay. I didn't patchstitch my backstay to the back coatpieces. I just sewed the backstay to the seamallowances. Not shown here is the thermal interlining. I used the lining pattern to cut the thermal interlining but I didn't add seamallowance on the shoulder and for the coat hem and sleeve hem. I sewed the thermal twopiece sleeves together and cut down the seamallowance to a minimum. I then sewed the thermal sleeves to the coatsleeves in the stitching line. I sewed the sideseams on the front and backpieces of the thermal interlining and sewed the thermal interlining to the shoulder seamallowance of the coat body. Remember to cut away as much of the seamallowance of the seam interlining to avoid too much bulk. The last step of making a coat is to sew in the lining. 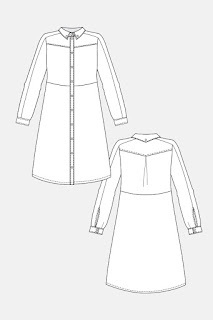 I didn't do a bagged linning, so I sewed the lining to the facings and then handsewed the hem of the lining to the coat in the sleeves and to the coat hemline. Are you still here? I´m sure this was quite a long and rather boring read if you are not planning a coat. I hope you can use my ramblings if you are making a coat yourself. Don´t hesitate to ask, if there is anything you would like to hear more about. 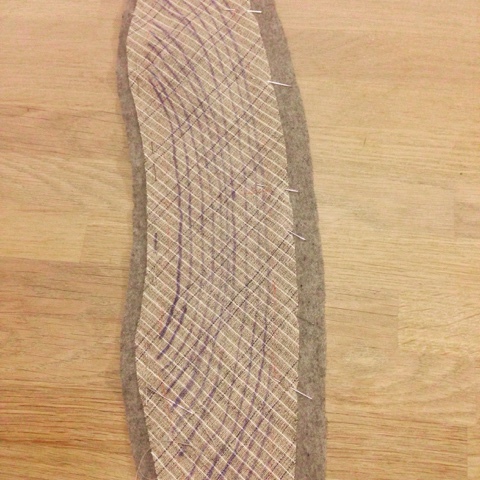 Coatmaking isn't that difficult - it just require a lot of patience if you are using the sew in interfacing method. Otherwise it's not more difficult than making a shirt. How about you - are you making a coat? - and which one are you making? 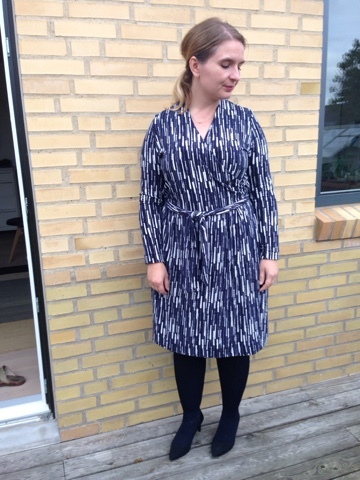 I had to start my blogpost about the Olivia wrapdress with a "hello" in finish. 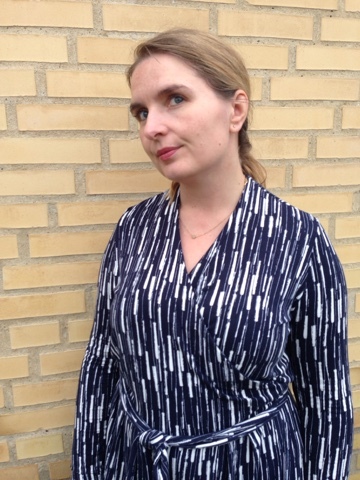 The Olivia wrapdress is from the cool finish pattern company Named Clothing. Named Clothing is owned by two sisters who release pattern collections a few times a year. I really like a lot of their patterns because of the modern and contempory vibe. All right, enough fangirl raving and back to the dress! This dress is as comfy as a pyjamas. 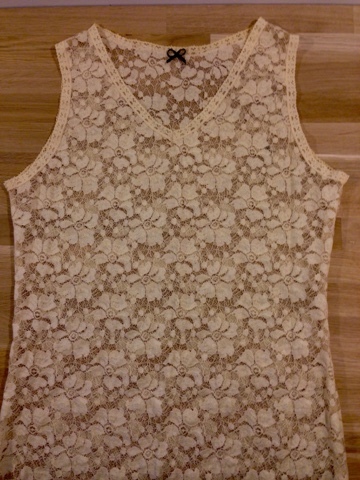 Its made from a soft viscose knit from Stof og Stil. 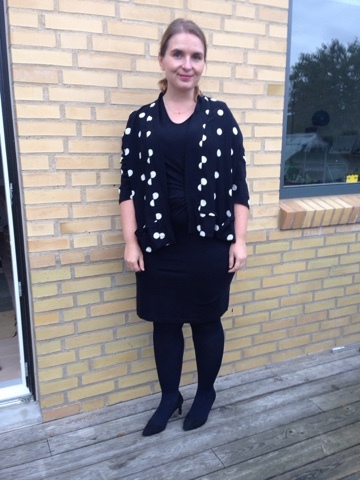 The dress is a fabric eater and requires 2,90m, but don't be tempted to buy cheaper stuff, because this dress is so comfy to wear, that you'll wear it again and again. 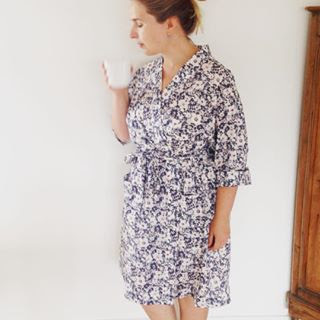 I have seen so many wrap dresses in the sewing community the last six month, but not in the shops? Sometimes the sewingworld creates it's own trends? I remember I had a wrap dress - maybe 10 years ago?. I also remember the skirt to be quite clingy and to show all the lumps and bumps I had back then. 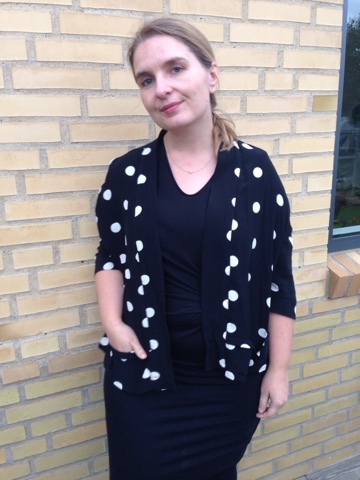 I still have the lumps and bumps - and these days I have even more than back then, but this dress is constructed with small pleats which make the sillouette on (curvy) women look more attrative. And the idea of sewing your own clothes is to get clothes that fit your body and not just the clothing companys idea of a body. Anyway, all this ranting was just to say, that I really like my wrap dress and I'm sure it will be an everyday dress I'll use a lot this winter. The only alteration I did on this dress was to cut off 13 cm. The pattern will give you a calf length dress, but I'm not sure this is a very good dress lenght on me. Do you plan your sewing after what you see in the shops - or where do you get your inspiration? I chose the Tokyo Kimono jacket pattern by Tessutti Fabrics because of the interesting pocketdesign. I think this small detail makes it a bit more special - eventhough I'm probably the only one noticing.. The fabric is a really nice drapy woven viscose I purchased from Fabricgodmother. (Don't look it up unless you are prepared to be tempted by all kinds of beautiful fabric). The viscose is a remnant from Coccinelle and I must say it's one of the best viscose fabrics I've had my paws on. 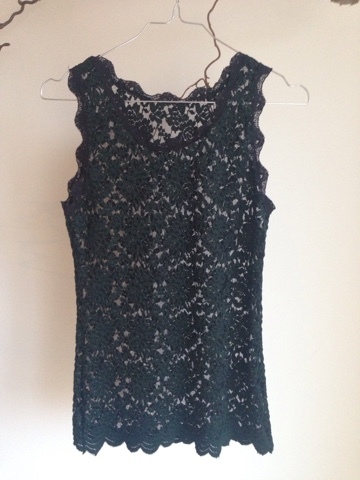 I'm considering buying more for a dress - maybe a Maryanne dress? 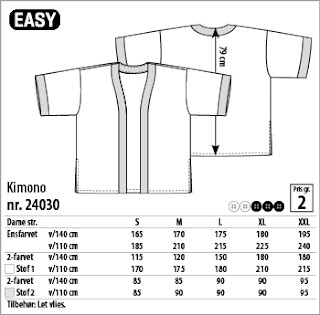 How you tried any kimono patterns you can recommend?